As the name suggests this project is about fabrication of a machine that is used for bending of pipes. My project is to design and construct a bending machine. This machine is used to bend steel into curve or other curvature shape. The size of the machine is very convenient for portable work. It is fully made by steel. Moreover it is easy to be carried and used at any time and any place. In various fabrication works as well as in architectural work pipes are used in artistic ways. To bend these pipes into these artistic forms is not easy thing to be done manually. Using a particular machine specially developed for bending of pipes helps. To build this machine many equipment or machine is used. By using all this equipment, process for making the project is faster and easier. I had also learned a proper method for operating all this machine and equipment. Choosing component material is very important, because it will affect the overall cost of the machine and the product quality. With this consideration, I had design this machine with the maximum quality and low in cost. The Forming Roller method of tube bending is recommended for all large bends. where the centerline radius is at least 4 times the outside diameter of the tube. It can also be successfully employed for bending pipe or heavy wall tubing to smaller radii and is the most practical method of bending very small diameter tubing. The Forming Roller and Radius Collar must be grooved to exactly fit the tube and the tube must not be allowed to slip during the bending operation as even a slight amount of slippage will cause distortion. Forming zero radius bends around square, rectangular, or other multi sided blocks employs the same principle used in scroll bending. Forming Nose “leads” material between corners of the block. Any number of zero radius bends can be obtained in one operation by this method in all types of solid materials. Both centered and off-center square eye can also be formed by following the same procedure outlined on. This method of bending is limited by the size of the square block and the ductility of the material. In general, when squares larger than 1” are needed, they should be formed in progressive operations using the zero radius block. This operation is somewhat involved by the fact that most materials “spring back” after they have been formed. To compensate for this, it is often necessary to use a Radius Collar having a smaller diameter than that of the circle required. Actual size can best be determined by experiment, as the “spring back” varies in different materials. Material should be precut to exact length before forming. In the constructional part of the project work, a base frame structure is fabricated using Mild Steel bars. A flat platform is formed on the top of this base structure.On this platform two mounting points are fixed. These mounting points are kept very robust in nature as they have to withstand huge lateral forces during working of the device. Set of combination of two numbers of affix-able meshing pulleys of various diameters are fabricated or machined. The peripheral cross sectional area of pulleys in pairs in any set is kept same either semicircular or half square depending on the pipe to be bent like circular or square cross section. Other pipes can also be bent but for that special pulleys have to be made. Hydraulic jack with Semi Circular pulley as shown in figure is fixed on the frame in between two pulleys and below it by calculating working distance . 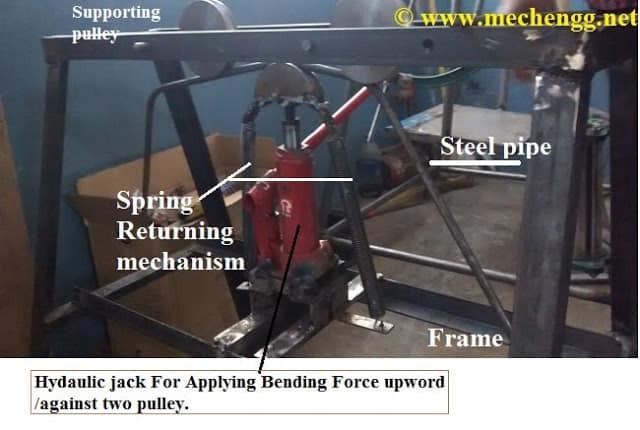 Provision for Adjustment of jack should be there to achieve any type of shapes and curvature. Quick retraction springs are attached to hydraulic jack upper end for easy and fast retraction of jack shaft. Springs should be designated in such way that it will not add more pressure or force for upper movement of the hydraulic jack. The pipe is inserted between the pulleys and the Hydraulic jack pulley as shown in figure. The Bending Force is applied with hydraulic Jack when the handle is operated. Thus pipe is bent. For desired diameter of bending curve the pulleys are changed or altered. This type of device is very useful for any fabrication work shop. what is cost of this?